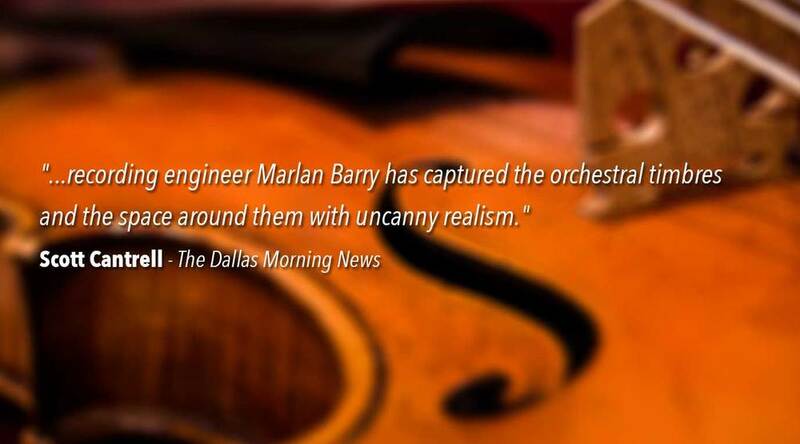 Marlan Barry specializes in orchestral, chamber, operatic, electro-acoustic and jazz recordings. In addition to recording and producing acclaimed musicians, chamber groups and orchestras in New York, Marlan served as the head recording engineer and musical producer for Houston Grand Opera for 15 years, producing its commercial releases and national radio broadcasts. From 1998-2000 he served as the chief recording engineer and production manager for NPR affiliate KUHF in Houston as well as the head recording engineer for the Houston Symphony and the Houston Grand Opera. Marlan has worked closely with Maestro Christoph Eschenbach and many of the world’s leading instrumentalists and operatic voices and conductors. You can hear his work on leading classical labels including Avie Records, Albany Records, Ondine, Naxos, Deutsche Grammophon, EMI Virgin among others. Marlan is a protégé of Grammy award winning recording engineers Jack Renner, Thomas Knab and Michael Bishop and trained through a unique joint program with the former groundbreaking Telarc Records and The Cleveland Institute of Music. After completing his cello studies with Alan Harris and Mark Schroeder at CIM, he followed Professor Schroeder to Ohio University where he earned his masters degree in cello performance.